Turbines and engines producing energy (Diesel, Gas, Steam, Wind Turbine) are all composed of metal parts exposed to severe environmental conditions (rotation or movement, speed, heat, vibrations, stresses). These components are subject to mechanical fatigue phenomena and so need to be treated in order to increase their lifetime and to prevent breakdowns. The downtimes generated by failures or preventive maintenance operations of these turbines and engines generate production stoppages and resulting significant operating losses. Reliability and reduction of downtime in the maintenance phase are major issues. Learn more about our dedicated applications to turbines. Download our brochure! SONATS has developed unique patented solutions for such applications. 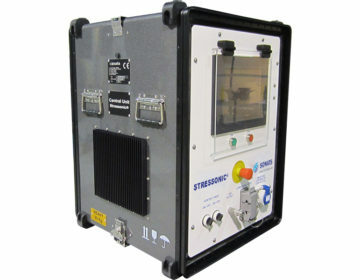 STRESSONIC® technology is clean, repeatable, quick to set-up and 100% controllable in order to ensure improved performance and availability of equipment. Indeed, SONATS designs and manufactures manual portable shot peening equipment equipped with STRESSONIC® technology that can be used when manufacturing parts but also during maintenance operations, without requiring complete disassembly of the equipment, which makes it the ideal solution, both technically and economically. Complete control and mastery of the shot peening process is necessary to ensure and maximise the fatigue resistance of components, generally complex in their geometry. SONATS solutions have been adopted by most prime contractors and equipment manufacturers in the sector. Safety and reliability are the main concerns of the nuclear industry. The resistance of materials to thermal fatigue and stress corrosion cracking must be ensured and improved to increase the lifetime and delay crack initiation. The need to lengthen the lifetime of nuclear power plants requires many preventive operations for critical equipment (pumps, turbines, pipe welds, etc.). STRESSVOYAGER® solutions can be applied in situ, without creating contamination, release of dust and without using consumables, a major advantage to increasing the lifetime of critical equipment by reducing their downtime. SONATS solutions have been adopted by several prime contractors and equipment manufacturers in the nuclear sector.